During the last several weeks, we have had an increasing number of promising contacts through our Internet site, www.editoriallapaz.org. Guiding them to a fuller knowledge of the Gospel, plus all other activities related to our work here, has been quite demanding on our time. Some of you have received a part of the following information through “News Briefs” sent by E-mail, and a few by means of a personal report when we were in Tennessee in November of last year. God has given increase to the seed sown in various ways, and for that to Him be the praise and glory. Your generosity makes possible the sowing. To you, so many are indebted for the salvation of their souls. 141 more converted through literature and the Internet. Two more congregations established through the Internet. Several in Venezuela through literature. Since Oct. 20, 2008, the date of the last printed report, through March 31, 2008, we have registered 141 more conversions attributed at least in part to materials prepared in Puerto Rico, and our Internet site, bringing the Grand Total to 13,881. 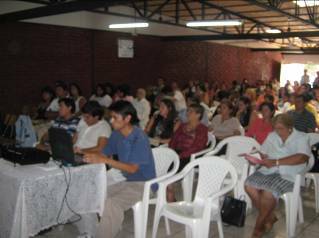 A congregation was established through our Internet site in Villa Gesell, Argentina, another in Camoapa, Nicaragua and several in Venezuela. This brings the Grand Total of congregations established to 240. -Venezuela. Recently, Benito Holguín called saying that he had established ten congregations in that country using material prepared in Puerto Rico, doing an “immense work” through the tracts, which he has distributed throughout that country. -Villa Gesell, Argentina. Church established through Internet. In September, 2008, we received an E-mail from two men, in Villa Gesell, Argentina, who identified themselves as “pastors” and stated that, having studied materials on our Internet site, they were in the process of turning to sound doctrine. We forwarded their E-mail to Daniel Jaramillo, a preacher in Pilar, Buenos Aires, and he, quickly making arrangements, traveled, accompanied by two brethren, about 300 miles to the South of Buenos Aires, spending two days in Villa Gesell. They baptized Marcelo and Marcela Gotti, and Juan Carlos and Liliana. In December, these new brethren baptized Nelly, Juan Carlos’ mother. The five are seen below, in the first picture, in their meeting place, and in the second, Bro. Marcelo Gotti stands in front of the meeting place. The church of Christ, Villa Gesell, Argentina. Established in September, 2008 through Internet contacts. 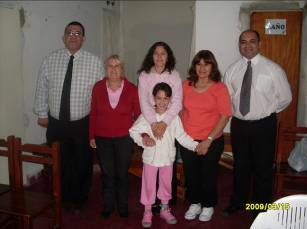 March 12th, Daniel and his wife, Tatiana, with their two daughters, travelled by bus to Villa Gesell, a ten-hour trip from Buenos Aires, to confirm this young church in the faith. 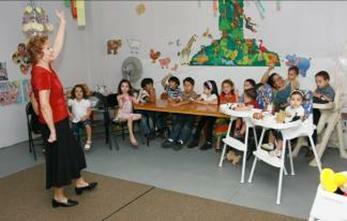 While Daniel studied with the men, Tatiana held classes for the ladies. The Bayamón, Puerto Rico church underwrote the expenses for this trip. A gospel meeting will possibly be conducted in Villa Gesell before the end of this year. Daniel Jaramillo, his wife Tatiana and their two children. Baptized in Medellín, Colombia when he was twelve years old, after graduating from high school, Daniel studied at the Bible School of the Americas, in Panamá. After graduating there, he did evangelistic work in Medellín for two years, helping to set up a branch of the Bible School of the Americas in that city and teaching in it for four years. He then went to Argentina, supported by the West Huntsville, Alabama church. Sunday, March 15, 2009. 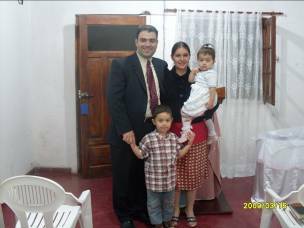 Daniel and family meet with the church in Villa Gesell, Argentina. -Camoapa, Nicaragua. Church established through our Internet site. November 23, 2008. “God bless you! My name is Evaristo Ortega, I am from Nicaragua and I am in a church of Christ in the city of Camoapa. 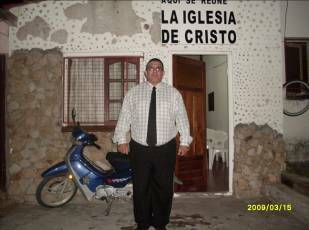 Before learning about the church of the Lord, I was in some sects, but thanks be to God who lead me to the Internet, and while investigating sound doctrine, I found the church of Christ, the first one being in Bayamón, Puerto Rico. That happened six months ago. Then, checking to see if there was a church in my country, I found one in Managua listed in the telephone book. Making contact with some elders, they invited me to come meet them, and this lead to my baptism as the Bible teaches. 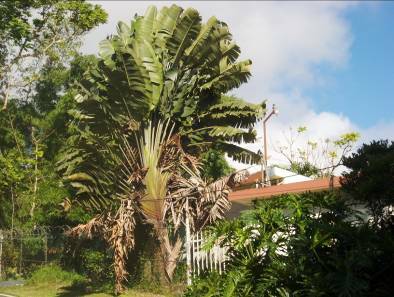 We are now a group of eight members here in Camoapa.” As of Feb. 5, 2009, there were ten members in Camoapa, according to a recent E-mail from Evaristo. Barranquilla, Colombia. 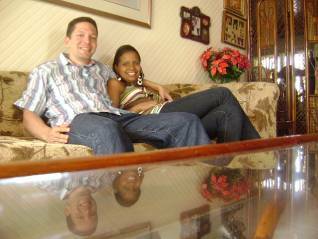 Gustavo Olarte and his wife. Armando Morales, his wife Ana María Perera, and Teresita Vega. Converted through the Internet site. Members in Bayamón, Puerto Rico. -Barranquilla, Colombia. November 24, 2008. “My name is Gustavo Olarte, and I am from Barranquilla, Colombia. I learned of the church of Christ by this means (Internet and E-mails) through the preaching of Ana María Perera and her husband Armando. After being in many different religious denominations, and analyzing conflictive subjects, I decided to obey the Lord and be born of the water and the Spirit, and thus I have had my sins washed away in water and now am a member of the Kingdom of God. I am very joyful and wanted to share my happiness with you.” I forward to Ana María some of the Internet contacts, and she will work tirelessly trying to guide them to a correct understanding of the Gospel. Possessing a nearly photographic memory, she has a command of the Scriptures not a few preachers would envy. But, she did give up on Gustavo for a time. He had been a Jehovah’s Witness, and gave her a hard time. Then, he surprised all of us with the above E-mail. We continue in contact with Gustavo and he is active in the congregation where he was baptized. Let me tell you more about what Ana María is accomplishing through the Internet. -Buenos Aires, Argentina. Claudio Damián was baptized March 15, 2009 by Brother Carlos Cedila. Ana María made contact with Claudio through a religious chat room on the Internet. He became interested in her contributions and they began an exchange of E-mails. Her guidance resulted in his renouncing Pentecostalism and making the decision to be baptized. -Metan, Salta, Argentina. Working in a similar way, Ana María taught Franco Scocco the pure gospel. He is waiting to be baptized as soon as a brother can go to him. Daniel Jaramillo has expressed a willingness to go, the journey from Buenos Aires to Metan taking fourteen hours by bus. Efforts to coordinate with some member closer to Franco have not been fruitful. -Buenos Aires, Argentina. Vicente Rodríguez, an Internet contact, was baptized Sunday, February 8, 2009, in Buenos Aires by Brother Carlos Cedila, who did the effective follow-up. Vicente attended about three months before being baptized. -Puerto de San José, Guatemala. Three converted through tracts. “All the material has been useful. 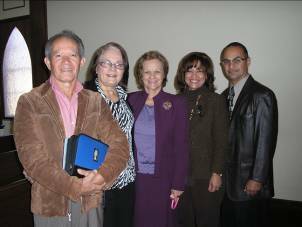 On December 28, 2008, Carlos Rodas, Wendy Canahui and Lilian Rodas were baptized. I gave Carlos tracts months ago, and two weeks before his conversion he asked me to come to his house, and there I taught him the gospel of Jesus Christ. A week later, he, his wife and their eldest daughter were baptized.” Wenceslao Guttiz Hernández. Puerto de San José, Guatemala. Carlos Rodas, Wendy and Lilian baptized. -Querétaro, México. Jaime Hernández called recently, stating that he was converted years ago through the tract “The Incorruptible Seed.” He is now preaching for a congregation outside the city of Querétaro. -Villa de Posos, San Luis Potosí, México. Oct. 22, 2008. Five converted through literature. Report by Eduardo Sánchez Salinas, Valle de los Dueños 324, Frac. Los Silos. 78394. -San Francisco de Macorís, Dominican Republic. David Guerrero told us by phone that literature from Puerto Rico has produced “much fruit” in his area. Recently, we sent him a rather large quantity. -David and Miraflores, Panamá. Feb. 18, 2009. José Luis Miranda reports conversions through the use of literature sent from Puerto Rico. “Some of the materials which have made the greatest impact on people are: ‘Pastors Going After Believers’s Money,’ ‘Tithes Were Abolished,’ and ‘I Am Catholic, you tell me. Would you be so kind as to explain to me why you are a Catholic?’ Also, the booklet: ‘Open Letter to the Evangelist Yiye Ávila.’ Many thanks for the good materials you offer on your Internet site. I myself have printed various evangelistic materials from the site, making them into tracts I distribute in my personal work. We have been honored in our congregation to receive various visits from friends who have been positively impacted by the content of the tracts, and have had conversions, thanks to the tracts prepared intelligently and efficaciously by you. I know that a number of workers like myself have been benefited in their evangelistic work through your efforts. The books and cassettes you sent me in times past have redounded in pro to the work and service of Christ.” In an E-mail dated Feb. 19, 2009, Brother Miranda details where he has been involved in works of the church. He began a congregation in the city of David (Calle Cuarta, Avenida 3) in 2007, baptizing eighteen between August and December of that year. As of February, 2009, the congregation has thirty-five members. 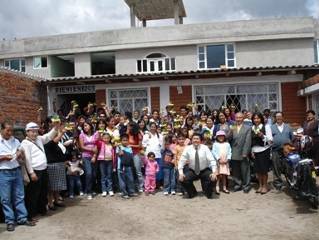 In February, 2008, he established a church in Miraflores, baptizing twenty people. José is a young man, a university student at the present time, and carries on his work for the Lord without personal support. Church in Ibarra, Ecuador. This congregation has reported many conversions through literature, both in Ibarra, and in other areas where they have worked. A part of the church in Población Nogales, Santiago, Chile. I was invited to address a nation-wide meeting of the church in Chile this year, but did not accept due to several considerations. Both pictures were received recently. -Córdoba, Argentina. January 24, 2009. Small group identifies with us. “I am filled with joy to discover there are other true brethren who bear in their heart this pure and uncontaminated doctrine, this real and true Christian way of life. We are a small group of brethren which our beloved Jesus Christ has charged with purifying His church, and this means of all that which has contaminated their hearts because they consider inadequate the word of Jesus Christ.” Emanuel Eneas, twenty-five years old, added further comments about what is happening in the religious world as he sees it. Follow-up with him is being pursued. -Guatemala. March 12, 2009. “My name is Octavio Díaz. I would like you to inform me if you have a church here in my country, with an address and telephone number, so that I may visit. I will tell you that I preach, and was named evangelist in my church. But, by means of the study I read (on the Internet), I became aware there is much to do in the churches, without judging but trying to follow correctly the holy Word of God. Where I meet, many things have taken place and I no longer participate.” Though there are reportedly more than 150 congregations in Guatemala, we have not yet been able to find one near where Octavio lives. His E-mail was forwarded to several contacts in that country. We continue to correspond with him. -Homestead, Florida. Recently, Saúl Marín called, explaining that he had organized a congregation of about 160, including children, most being farm workers from different Spanish-speaking countries. He said he did not feel qualified to properly instruct the congregation, and looking on the Internet, found our site. Saúl repeatedly praised the studies, etc., requesting we help him. We sent him a package of studies, tracts and ten or more CD’s of sermons and hymns. -Huaraz, Perú. After studying materials on our Internet site, four adults from three different families have left Pentecostalism and have begun meeting with a small congregation established last year, through literature from here, in Huaraz. They are: Yeny Mendoza Villaorduña, her husband Concepción, both engineers, and their 15 year old son; Hilda, a business woman, and her two children; and Victoria, a single lady. At least three have expressed a desire to be baptized, but have not yet taken that step as far as we know. Yeny writes on behalf of the group, and we continue to correspond by E-mail, responding to questions particularly about the organization of a local congregation and the handling of contributions. Concepción works for the University of Huaraz. The city of Huaraz is some ten hours drive from Lima. 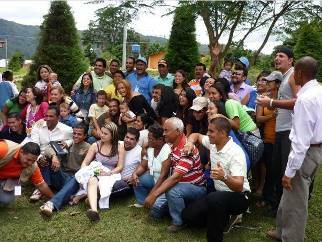 Giovanni Calderón conducts a marriage retreat in Venezuela during March, 2009. Left: 87 couples from eight congregations participate. Right: Ten people are baptized. Giovanni is the man at the extreme left, to the back, in the green shirt. He was baptized in Bayamón, Puerto Rico, and married Yvina, a young lady of the Bayamón church. This couple and their two daughters now live in Ft. Worth, Texas, where they have been instrumental in starting a Spanish-speaking congregation. Giovanni works for a software corporation, but makes time for valuable contributions to the cause of Christ. He goes on evangelistic trips to Venezuela, and was invited to conduct the marriage retreat he has recently completed with great success. Six of the ten baptized were unconverted spouses of people already Christians. That says volumes about the effectiveness of the five sessions on “Creative Marriage” presented by Giovanni. We at Bayamón are justly proud of him and his lovely family. -Venezuela. Giovanni Calderón finds our extensive “Analysis of the prophecies and visions of Revelation” being used in several congregations. “Various preachers and teachers who attended the marriage retreat for couples know about you and your work and are very impressed with your studies on Revelation. 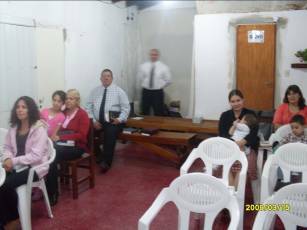 They are using them in several congregations, especially Brother Milexis Martínez, of the church in Ciudad Guayana. He and other brethren of that congregation talked about how much good they are getting from the studies.” This is the first news we have received about the use of these materials in Venezuela. Since we have not sent printed versions to those churches, it is to be assumed they are downloading the commentary from the Internet site. -Mayaguez, Puerto Rico. Sigfredo Velez, teacher in an Assembly of God church, called saying that he had found “much very good material” on our site, and requested we send him some copies. We did. -Buenos Aires, Argentina. “Thanks so much for your ministry. Many evangelicals are reading your site and learning the truth!” Osvaldo Valdez. March 14, 2009. -Place not identified. “Your Web site is one of the best.” Anthony. gabriel220408@gmail.com. -Maracay, Venezuela. February 21, 2009. “Dear brother, I decided to write because I want to express to you my satisfaction with the work you have done on your Web site. I believe it is one of the few sites I know, perhaps no more than four in Spanish, respectful and clean, true to the Sacred Scriptures and with a careful attention to sound doctrine.” Luis Adriano Barros Morales. -Río Cuarto, Argentina. After studying some of the material on our Internet site, Martín Lillo wrote that he agreed with us and would like to become a member of the church. In a later E-mail, he courteously asked me to consider changing what I teach about baptism for the forgiveness of sin. Further communication revealed that he believes in individual predestination, salvation by faith only and once-saved-always-saved. Obviously, he did not study material about these subjects on our site. Since he seems sincere, I proposed we study Romans 6:3-6, and we continue a lengthy dialogue based on that text. This is the kind of Internet contact that requires much time and patience. Though the person may not be finally convinced, we do usually adapt exchanges of this nature for Internet publication, thus covering more fully some doctrines or interpretations and thereby increasing the resources available. -New Jersey. Hinton Negrón decided to renounce Pentecostalism after studying related subjects on our site, and wrote an article about his experiences in that religion which we considered worthy of adding to the resources made available to the public. Due to certain circumstances I will not detail here, Hinton has not yet become a member of a church of Christ. We continue in contact with him. I had selected a number of additional positive statements about our Internet site for this report, but thinking they would make the report to long will not include them at this time. -Total visits to our Internet site www.editoriallapaz.org for the year 2008 came to 986,308. -Total visits for the years 2003 through 2008 were 4,011,987. After record highs in May, 2008, traffic decreased, as usual, during the summer months. During the Autumn of 2008, certain changes made by the Internet provider seem to have affected traffic negatively for a time, and then came the economic turmoil of the last three months of the year, no doubt impacting many in the Spanish-speaking world. For 2009, the daily average of visitors jumped from 1,999 in January to 2,233 in February, and by 506 a day in March to an average of 2,739. “Documents accessed” are a better indicator than “Hits” for the use of materials on the site. “Bandwidth” shows the quantity of “bytes” downloaded by visitors. “GB” means “gigabyte”, and is equivalent to 1,073,741,824 bytes. At eight bytes per letter, five letters per word and five hundred words per page, the number of such pages downloaded for March would be approximately 1,802,276, or 21.22 per visitor, but these figures are complicated by the number of bytes in pictures, of which there are several hundred on the site. There are more than 4,000 pages of material on the site. While many visitors may download only one “document”, many others download a number, and some spend literally hours on the site. Of the 84,918 visitors to the site in March, 12,822 were repeat visitors, leaving a total of 72,096 unique, or individual, visitors. All this data is supplied by the Internet provider. During the time covered by this report, we have produced 1,012 books of different titles, including 771 by Rita of materials for teaching children. While packing, I listen to sermons preached in Bayamón and have selected nineteen of the better ones for recording on compact disks. Rita designs and prints beautiful labels for the CD’s. Lately, we have produced approximately 1,675 CD’s, already shipping a large part of them. Following is a record of production through March 31, 2009. -Dominican Republic. We shipped fourteen boxes of materials to the Dominican Republic through a freight company which provides service between Puerto Rico and that country. The cost was exactly $100.00. The compact disks are of sermons and hymns. -Houston, Texas. Twenty-one packages, for congregations in Mexico, to be picked up by brethren attending the Seminario Bíblico Houston (Houston Bible Seminary), scheduled for April 9-11, 2009. Expected attendance: 400-500. Fourteen of the packages contain: 200 tracts, 7 books and booklets for teaching children, 7 books for preachers and teachers, including one of 528 pages, plus 12 CD’s of sermons and 2 of hymns. The remaining seven packages do not include the 528 page book. Different places, some going via the USA to other countries. -Plus scores of smaller packages either mailed or delivered personally. -Bayamón, Puerto Rico. Average Sunday morning attendance continues to be just above 100. -Mario Pérez Ginés, son of Sister Dayra Ginés, was baptized recently. -Three of the leaders of the congregation, to be accompanied by four or five members, are scheduled to go to the Dominican Republic the last week in June, where they will review benevolent and evangelistic works made possible by regular contributions sent by the Bayamón church. The men will preach in a gospel meeting to be conducted by the Barahona, Dominican Republic church. -The Bayamón church has set aside $5,000.00 to help cover expenses this year incurred in the production and shipment of literature, CD’s, cassettes, etcetera. We did not request a contribution but are certainly grateful for the understanding and liberality of the Bayamón leadership. This church continues to pay for the Internet site. We also donated $500.00 for works in El Salvador carried out by the Barrio Cubuy, Puerto Rico church. Rita teaches the little people in Bayamón. She really teaches, not just entertains. Luis Sardina teaches the class of young adults in Bayamón. Pictures by Javier Castrodad, professional photographer and member of the Bayamón church. -Caguas, Puerto Rico. The church in Sector Chiro Aponte, Caguas is one of the congregations we have been instrumental in establishing in Puerto Rico. Brethren have been meeting for some thirty-five years. Present attendance is from 55 to 70. Ten were baptized en 2008. 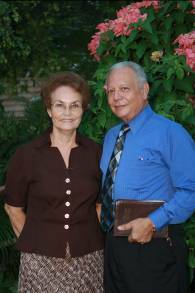 Brother Manuel Quiñones and his wife Juanita were two of the first four converts. Still active in the work, they are now, respectively, 82 and 77 years old. Seven people from Aguas Buenas, the municipality where we live and have the printing facilities, are faithful members in Caguas. The congregation has its own, very fine meeting place. -Gurabo, Puerto Rico. At a commemoration of its 38th anniversary, the Gurabo church presented me a large plaque, and a dozen roses for Rita, in recognition of our work through the years. 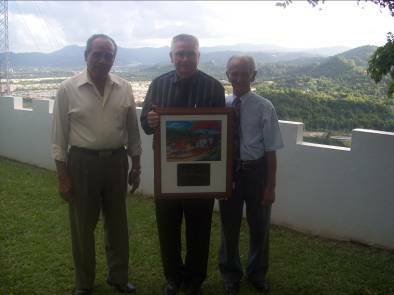 In the picture on the next page, I am standing between Abraham Carrión, on the left, and Félix Roldán, on the right, two of the earliest converts who have served as leaders of the congregation since shortly after its beginning. Behind us is the Turabo Valley, with subdivisions in the western part of Caguas. The mountains to the right are part of the central range. Gurabo is about three miles east of Caguas. Unfortunately, we did not get the proper lighting for this picture. Rita did not feel well enough to attend the activity. 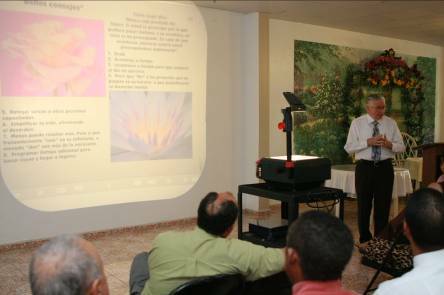 -I presently teach five classes weekly –three at the School of Advanced Bible Studies each Monday night, and two in the Bayamón church. Preparation of lessons for these classes, including many presentation graphics, often takes much time. Most, if not all, of these materials are added to the resources on our Internet site. -My brother, Larry Shappley, of Jackson, TN, passed away suddenly in March. He would have been sixty-eight on April 25th. -Mark Pierce’s grandmother, Lona Curley, passed away in Shelbyville, TN during March. She was ninety-three. Mark is our daughter, Sharon Laretta’s, husband. He continues preaching for the Horse Mountain church, near Shelbyville. In November, 2008, Rita and I spent a week in Orlando with Antonio, Irelis, Kevin and Kiara Karina, in a time-share they have. 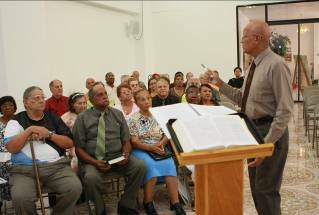 Spanish and English-speaking congregations meet at the Concord St. facilities in Orlando. What a joy to find there people we had known from other areas! 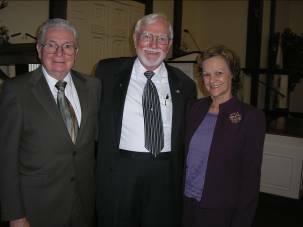 Left: standing between Rita and myself, Chuck Lipford, a brother from Friendship, TN, where Rita lived when we met. He now lives in Orlando. Left to right, Rubén Segarra and his wife, converted in Lares, Puerto Rico, through a study published in a newspaper. Sis. Segarra’s sister, Lali, is a member in Bayamón. Then, Rita, Carmen Mejía and her husband. Carmen is the daughter of Julio and Irma Mejía, of El Salvador, presently working for the church in Lenoir City, TN. Julio, born in Nicaragua, played a key role in the evangelization of Nicaragua, Costa Rica and El Salvador. He invited me to present leadership studies in San Salvador in 1993, and for a return engagement in 1994, one of the greatest experiences of my life. -In addition to our regular work, Rita and I are in the process, as time allows, of rather extensive printing plant maintenance. This is a part of our “physical exercise program!” It seems just about all flat, concrete roofs filter humidity, causing the paint on the inside to gradually turn to dust or just bubble and fall off. The least enjoyable maintenance work? Scraping the paint off the inside roof! New and better products are making it easier to seal the concrete. Hope they work this time! -Beginning this month, April, 2009, we plan to post “News Briefs,” in English, to our Internet site. If you wish to read them, please go to www.editoriallapaz.org. Below the three rows of graphics, which are links to major sections of materials, there are three lines of additional links. In the third line, click on “English Info and Four Tracts.” This will take you to the “Page” of statistics, in English, for site data and production of materials, where we post monthly data on Internet traffic, and where there will be a link to the “News Briefs.” If you wish to have “News Briefs” sent to your E-mail address, we shall be glad to comply upon receipt of your address sent to us by using the "Sus Comentarios" panel on the right hand side of every page to register your email and request with us. 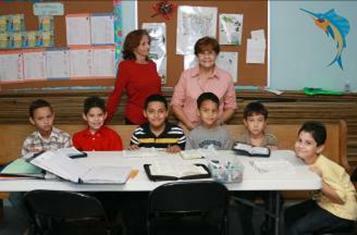 Carmen Massa and Ana Espinet teach six young boys in Bayamón. Two teachers to six students: About the ratio needed! 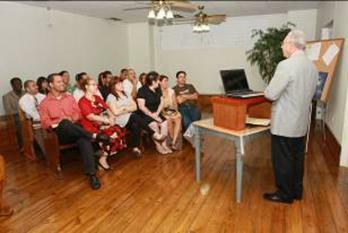 José Álamo teaches the above-65 group in Bayamón. He is outstanding! Despite having to undergo dialysis three times weekly. Luis and Mirna Sardina. Luis is one of six men who guide the Bayamón church. Very studious, he preaches, teaches and is one of the treasurers. Dewayne Shappley teaches the middle-age class in Bayamón, using presentation graphics for a series entitled “Wise Counsel,” translated from a document in English sent by Bro. Larry Harper, of the Cairo, TN church. The flash from the camera lightened the image. Teachers take turns with different classes. Pictures by Javier Castrodad, of the church in Bayamón.